Sony Xperia Z1 Compact offers flagship features in smaller design | What Hi-Fi? 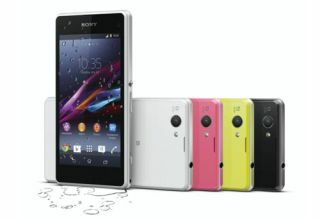 Sony unveils the Xperia Z1 Compact smartphone, offering flagship features with a smaller body and cheaper price tag. Sony unveiled a new smartphone at CES 2014, bucking the trend for lower specced ‘mini’ phones by piling most of the features and performance from its flagship Xperia Z1 phone into a much smaller body. The Sony Xperia Z1 Compact packs a 4.3-inch Triluminos HD for mobile display (instead of its sibling’s 5-inch screen), and is 30g lighter at 140g, but very slightly thicker. The screen does take a dip in resolution down from Full HD to 720p though, and pixel density is a little lower too, with 341ppi instead of 440ppi. That aside, it’s very much the flagship phone, with a 2.2GHz quad-core processor, 2GB of RAM and 16GB of on-board storage, expandable via microSD. NFC and 4G LTE are both on board as well, and Sony claims the Z1 Compact offers the best battery performance when compared with its other ‘compact’ phone competitors. Elsewhere, the 20.7-megapixel camera found in the Z1 is on board, complete with the same extensive camera functions, and you’ll get the same dust and waterproofing as well. It will come with Android 4.3 on-board at launch, with an update to Android 4.4 ‘Kit-Kat’ promised very soon afterwards. Alongside black and white designs, the Xperia Z1 Compact will also be available in bright pink and lime green from February. Expect it to come in on lower-priced contracts than the Xperia Z1, with a UK SIM-free price to be confirmed.